Atlit, Israel – Salt of the Earth Ltd. announces a successful trial of its sodium reduction ingredient, Umami Essence, in canned tuna. The novel ingredient to enable sodium reduction is a propriety, all-natural, MSG-free, liquid formula derived from vegetables and pure sea salt. 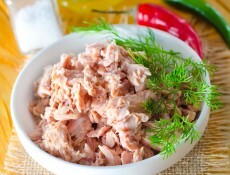 The average sodium level in canned tuna is about 350-400 mg per 100g. Incorporating Umami Essence ingredient into the brine was able to reduce total sodium to approximately 250mg. The tuna trial examined flavor with and without the Umami Essence ingredient, evaluating how much sodium reduction is possible without influencing taste and mouthfeel. Trial methodology included 50 participants furnished with 100g tuna. The salt reduction tested in the trial represented levels of 25%, 35% and 50% sodium reductions. The Umami-Essence ingredient was added to the brine in proportion of 1:1 per the reduced sodium. Test results showed that canned tuna with a sodium reduction of 35% (from an aggregate 350mg to 250mg sodium) matched the taste of the original recipe. Using Umami-Essence ingredient in a new or existing product formulation can help dramatically decrease sodium levels—in some formulations by up to 50%—while boosting flavor. The all-natural ingredient contains no MSG or artificial ingredients, and enables clean label.